Derby Cup | Custom wood specialities. Made in the USA. This bonded leather gate-fold Julep Case was created by Pocumtuck for a specialty silversmith to present, store and display their Kentucky Derby Mint Julep Cup. 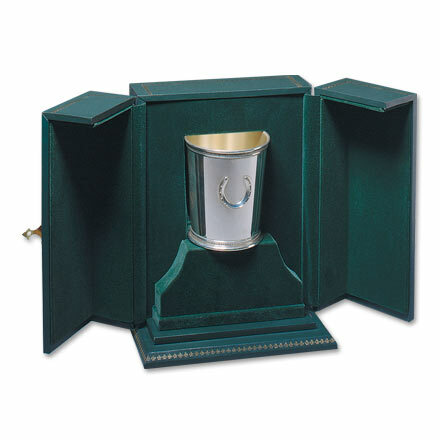 The cups, and case, were presented at Churchill Downs during the Derby as race prizes and gifts. Box is solid wood framed, with gold foil embossing on the leather. Made in the USA.